Everything you need to know to become who you truly are, and create the life you always dreamed of. Soon very soon we will open up a sisterhood member´s club – for you who seek a alternative way´s of healing your self and living and create a life on your own therms. The Happy S♥ul Sister Tribe – Members’ Club is and will become one of the most powerful & supportive memberships for females around the world who seek a happy and alternative way of living. We’ve already helped hundreds of women around the world to go from feeling lost, frustrated and confused, because they did not know them self and had no direction in their lives, and no support to follow their true purpose, – to creating their dreams life, become happy and fulfilled, and own them self for who they are. What would your life be like if you had the right help & support to create the life of your dreams? Stay tuned – soon the club will open – But meanwhile, JOIN The Happy S♥ul Sister Tribe. Please check your email after you sign up. Free Daily Self Love Checklist. 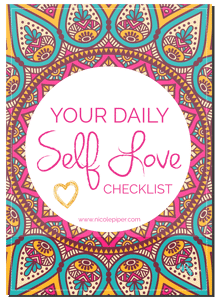 Download this daily self-love checklist that will provide you not only with simple & powerful ways you can practice loving yourself, but also amazing tools to get to know yourself better.